Since 2000, Datacon's software has included the option to "print" to email. 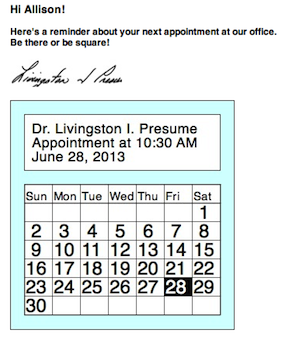 This capability is most often used for sending email appointment confirmations to patients. In recent years many of you have also begun using the option to send text messages to patient's phones. We have had frequent requests for the option to send more than just plain text in confirmation emails and we are pleased to announce that this is now possible with the June 2013 update to the Dental software and the Mac server software. This free update provides several new capabilities and simplifies the steps we must take to setup mail on your server. HTML email - With this update it is now possible to format your email using HTML. Most commercial email is formatted using HTML (HyperText Markup Language). This is the same language that is used to create web pages and there are all sorts of tools available for creating content. Our software allows Datacon merge fields to be mixed in with HTML commands that control layout, fonts, color, and images. Attachments - Email sent by your Datacon server can now include attachments. They can be things like reports or images that the recipient might wish to save or they can be hidden attachments such as a logo or other image to be inserted into an HTML email. Multiple "From" addresses - Before this update, we usually only used a single "From" address for the entire practice. Now we can configure the server and our documents to automatically send email from several individual as well. Attachment Creation - Any of Datacon's print merge fields can be used to create JPEG email attachments. Our support staff has years of experience using these commands to create recall cards, route slips, and other documents and this drawing capability can be used to create images that can be included in email. An example of this is our calendar which marks a patient appointment date. This can easily be converted to an image and included in an HTML email. PDF Reports - Does your accountant need a report? No problem. When you print the report, choose email as your printer choice and the report will automatically be converted into a PDF document and sent in an email. You are presented with a form where you can enter the subject and recipient's email address along with a short note. We have repeatedly said that the upgrade to a Mac server will allow our clients to benefit from our ability to leverage the sophisticated capabilities offered by a modern system. We are excited to offer this email update as another example of what can be done.